As well as relationships with local clubs, the Club enjoyed international connections, including a standing relationship with the Rocky Mountaineers MC and the Ohio Rangers MC. Several Rangers members had participated in joint Australian-US runs from the late 1970s, evidencing the deeply-forged friendship between Clubs on both sides of the Pacific Ocean. After 31 years of continuous operation, the Rangers MC disbanded, due to lack of membership. The closing event coincided with the Club’s 31st anniversary dinner. The Club was one of the last of its kind in Australia to close, and ranks as one of the longest-running clubs of its kind to have operated in Australia. The Rangers MC logo represented a stylised arrow upon a circular ground, applied over a map of the State of Queensland. The word ‘RANGERS’ was central to the logo on a white ground, diving a brown and green background. 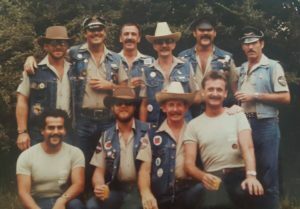 Rangers MC members in Club uniform at the South Pacific Motor Club Comerong Run 1984. The Rangers MC Consisted of a khaki short-sleeved shirt embroidered with the Rangers MC Logo, worn tucked into jeans. A denim jacket or vest could also be worn, emblazoned with Club patches and badges from places visited. A number of special patches were produced by the club to commemorate significant anniversaries, which were to be worn on a member’s jacket or vest.